This absolutely huge combination of colors and patterns on the north side of 710 Main Theatre is the work of two Baltimore-based artists. 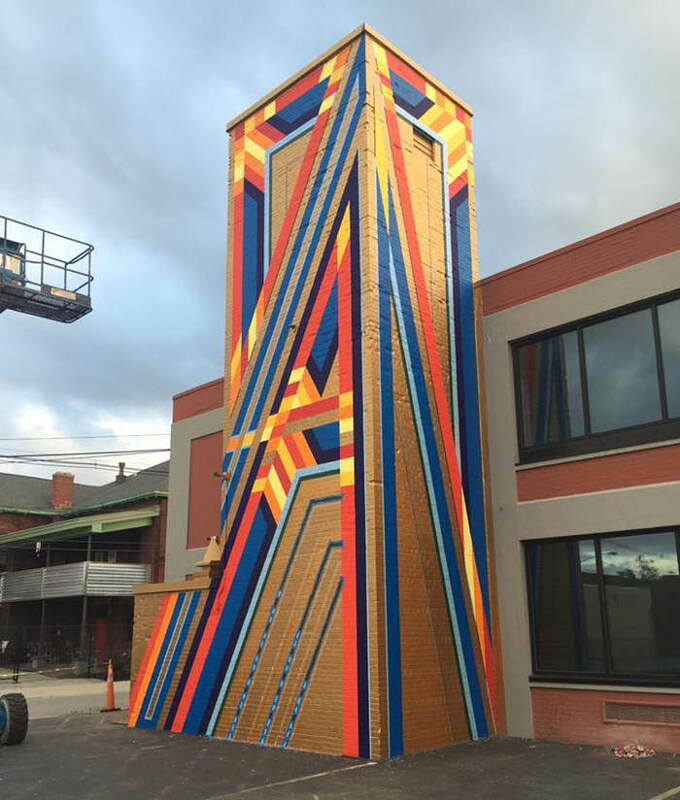 Since day one of the project the city has been buzzing with interest in the bold geometric mural. Rumor has it Jessie Unterhalter and Katey Truhn have a reputation for painting bright, beautiful murals that bring a sense of happiness and joy to the chosen area. The blend of patterns, textures, and shapes in this one makes for a masterpiece that’s so mesmerizing you’ll hit the brakes and pull over to appreciate. A mural created by Brooklyn based muralist Alice Mizrachi and a group of art program students is now proudly displayed at 1221 Main Street. Thanks to a collaboration between the Buffalo Center for Arts and Technology and the Albright-Knox Art Gallery, this strong vision was made a reality. 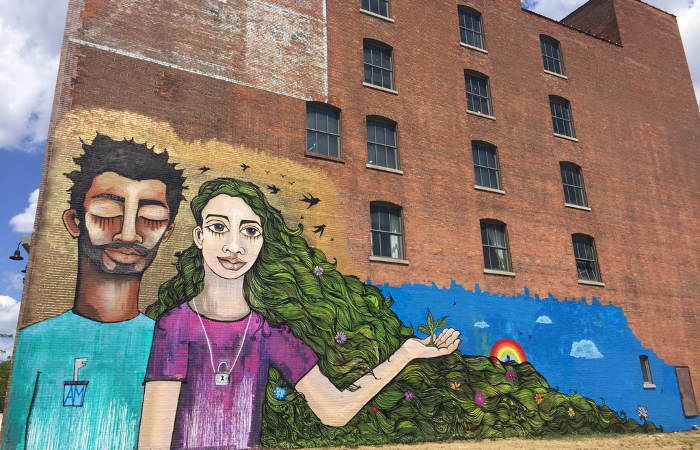 The large mural features a dark-skinned boy with tears running down his closed eyes while next to him, a light-skinned girl with landscape-like wavy green hair leads you to a peaceful scene. The message is clear, displaying the desire for unity across cultures which came about from a discussion with the students. 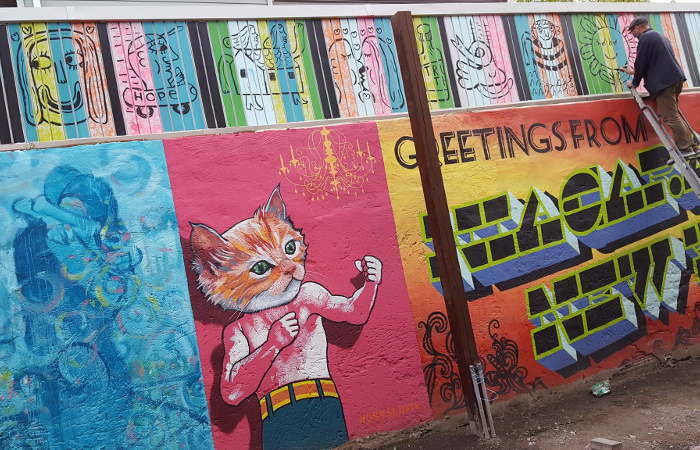 We hope to see more student murals throughout the city in the future! You may or may not have noticed that almost every traffic signal box in the Elmwood Village is painted differently, each one more unique than the next. Pictured in front of the restaurant “727 Elmwood Ave”, AKA the old Blue Monk, is artist Chuck Tingley’s “Face” painting. If you stop to notice the detail, you’ll realize that this particular signal box is plastered with a map of Buffalo used as a backdrop by the artist for his beautiful painting. Continue strolling to appreciate each traffic signal box. 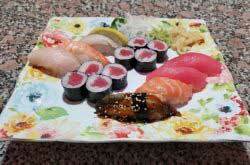 We love the fact that artists think to turn something so ordinary into a work of art. 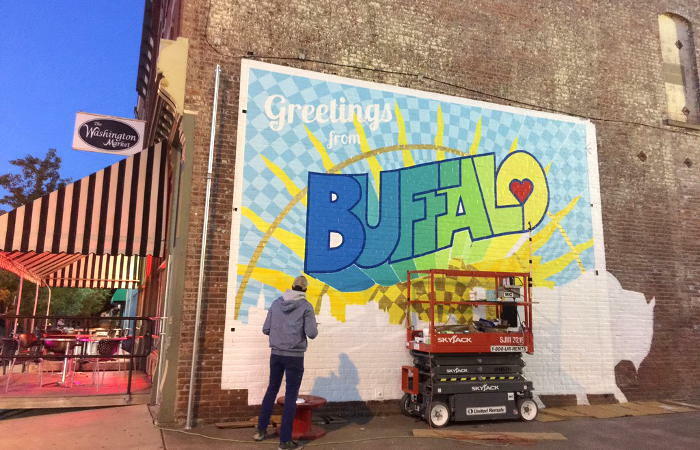 This bright Buffalo mural is grabbing the attention of locals and visitors, portraying the message that we are in fact the friendly, city of good neighbors we’re known to be. Artist/graphic designer Casey Milbrand is determined to bring large postcard-like murals to Buffalo like he’s seen in other cities while traveling. The hope is that visitors will spread word through photos of the postcard murals as a kind of viral greeting card to spread the warm welcome you can expect if you visit our city. Read more about how this street art came to be here. Chris Kameck and Nick Conrad Miller, AKA Team Razor Wire, are developing a stunning mural on the side of the Tri-Main building on Halbert Street. The “Tower of Power” is just one of a handful of beautifully designed murals the team has stamped throughout the city. Their works of art have been given a combined name of the “Advantageous Geometry Series” highlighting their geometrical approach. 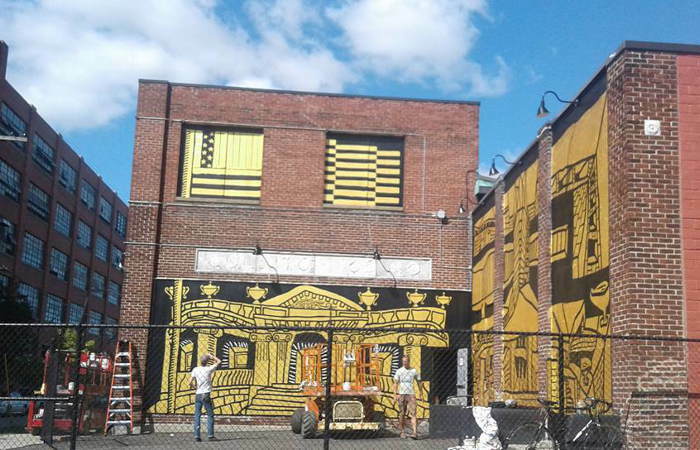 The Albright-Knox is behind a striking black and gold mural making it’s mark near the Tri-Main Building. In this piece artist Daniel Galas, the artist behind Buffalo Architectural Prints, pays tribute to local architecture using only two colors – black and gold. According to albrightknox.org, “black relates to the artist’s established practice of printmaking and drawing, and gold is meant to elicit an intuitive response from the viewer that acknowledges the civic value of honoring our shared heritage”. 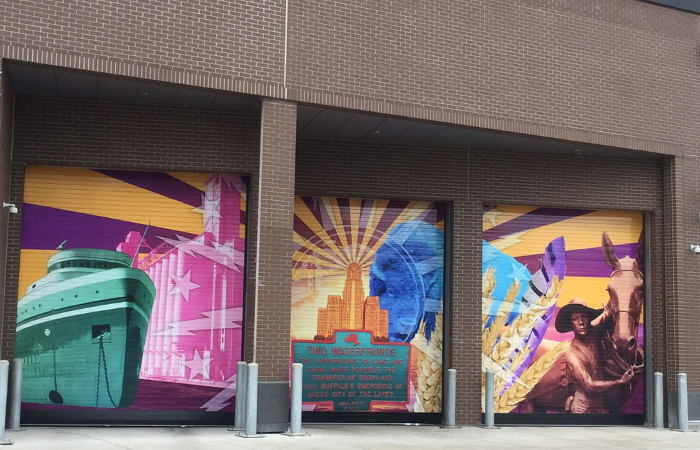 Within the mural you’ll see several familiar structures represented including the Elephant House at the Buffalo Zoo, the Kensington Water Tower, the Pierce-Arrow Showroom, and the Darwin D. Martin House among others. 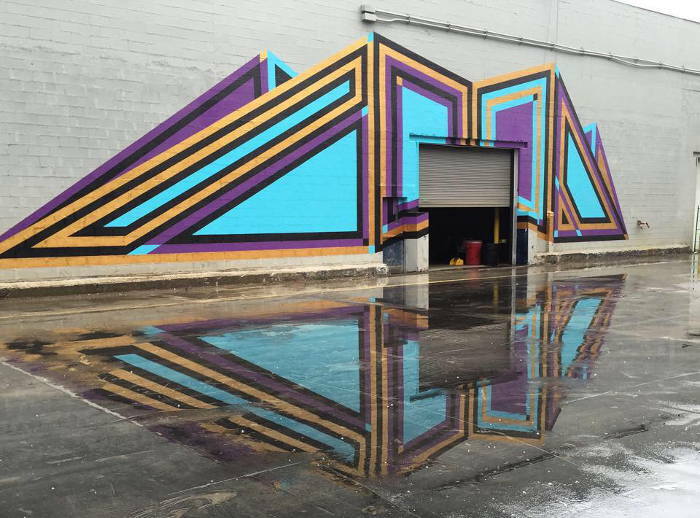 For the Echo Art Fair in Spring of 2016 members of Team Razor Wire designed and executed an Instagram-worthy mural surrounding the entrance to the factory space where the event was held. The shape and color combinations used to create this mural make this piece every bit worth checking out. Vibrant blue, purple, and yellow shapes draw you in, and create a memorable example of what you can expect to see at the Echo Art Fair in the years to come. 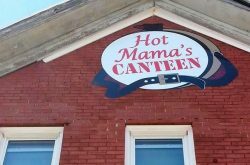 Let’s face it, when out-of-towners bring up Niagara Falls, locals tend to recommend the Canadian side over the American more than ever these days. However one new reason to stay state-side is Art Alley where artists have taken over the 400 block of Third Street and Ferry Avenue to create a sort of outdoor art gallery full of wall murals. Not only will Art Alley be a site to see, it will also serve as a focal point for events with free parking available to the public. 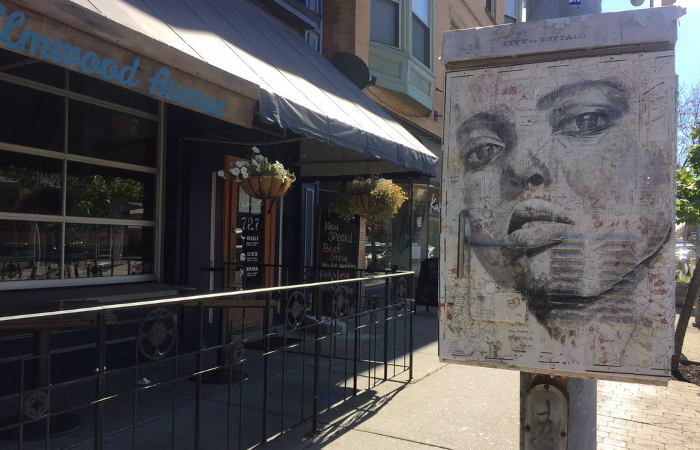 Rob Lynch, a Niagara Falls high school art teacher and the man behind Art Alley is collaborating with several artists to make this dream a reality. 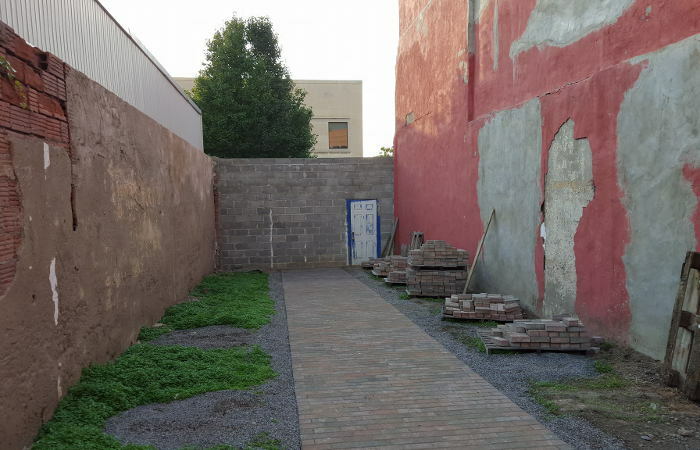 Stay tuned for the official opening date of Art Alley here! 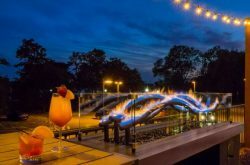 The HarborCenter held a public art contest this past February to select artists who would create art for the dock doors at the HarborCenter. Lewiston residents and contest winners Thomas Paul Asklar and Matthew Sinclair Conroy’s design symbolizes Buffalo’s renewal while respecting the city’s rich history. 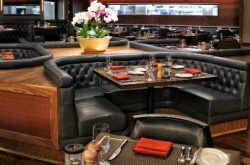 According to harborcenter.com, the color purple is incorporated to signify royalty, paying tribute to the Queen City. Hidden details represent Buffalo’s art and history while City Hall makes a bold statement front and center. The bison is set to the side of City Hall, representing the city’s name and Native Americans who held the buffalo to a level of high importance. A mule signifies the important past the Erie Canal held for immigrants and our success as a city. The SS Anderson is included in the mural to remind us that it held a vital role in the shipping industry and is still running today. 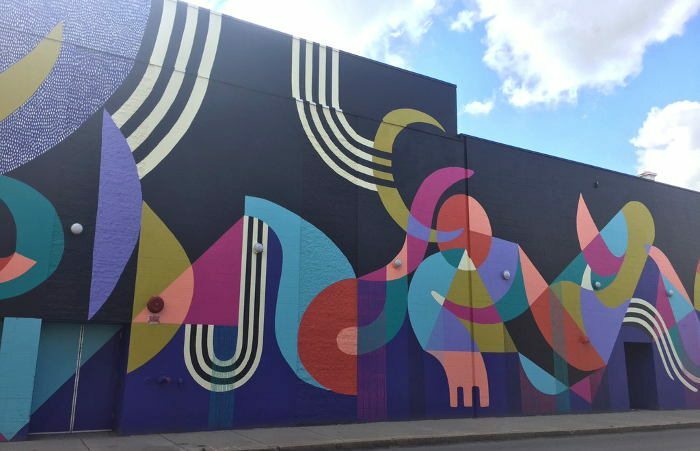 Local mural/contemporary artist Vincent AJ Alejandro was born in the Old First Ward and recently moved back to Buffalo after leaving for military service in the 90’s, living in various locations in the U.S. and Europe. 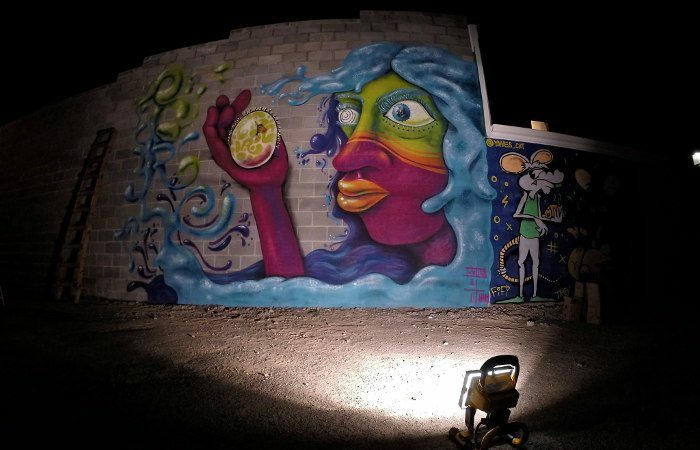 Since moving back he’s become a full time artist specializing in murals. You may have also seen his work in the Ward along the including the 5000 sq ft Old First Ward History mural on Republic street, the “Buy Local” mural on Bailey (Buffalo Paint and Wallpaper) among others. 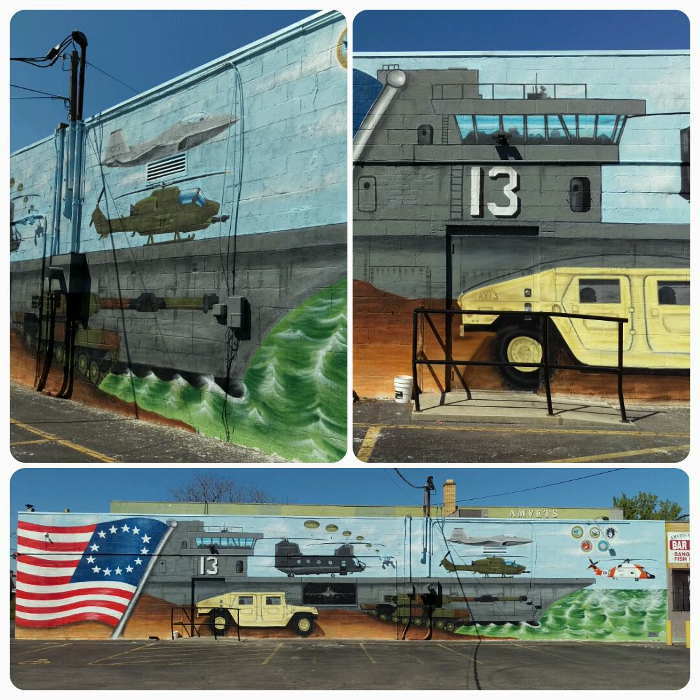 The Veterans Mural in Riverside came about after Elaine Grisanti (of the community canvases signal boxes) connected Vinvent with the River Rock Community Coalition who was looking to “spruce up” the wall on the side of Amvets Post 13 facing Tonawanda street. “Being a veteran myself I wanted to represent not only those I had served with but also the ones who wore the uniform before me,” Vincent explained. “The best way I knew to represent it was through military modes of transportation throughout the years. The air craft carrier represents our pilots and seamen, the Cobra attack chopper representing the Vietnam era, the HUMMV or Hummer representing our desert conflicts, The Chinook helicopter representing the Marines and Army troops alike, and the F22 Raptor representing the Air Force and the present servicemen in uniform. The Coast Guard is also represented by the rescue helicopter protecting our waters.” The entire wall was completed in just under two weeks this summer.